Three done, three to go! These updates were sent in by LISA Pathfinder Spacecraft Operations Manager Ian Harrison Monday evening and this morning, reporting on the results of the Nos. 2 and 3 apogee-raising engine burns (referred to as ‘ARM’ for ‘apogee-raising manoeuvre’ by the teams at ESOC) . If you read our post yesterday, you’ll recall that these are the second and third of six planned burns, and all are crucial for getting LPF safely en route to the 1st Sun-Earth libration point (L1), from where it will conduct its mission. ARM#2 was completed successfully at 2015/12/07 17:21 UTC [18:21 CET]. Evaluation of the burn performance showed an error of less than 0.3% against the planned deltaV – ‘change in velocity’. The next burn, ARM#3, is planned for 2015/12/08 07:31 UTC [08:31 CET]. The ARM#3 burn was executed successfully on 2015/12/08 at 07:31 UTC [08:31 CET], and the spacecraft’s signals were acquired on time via ESA’s 15m Kourou ground station. Initial assessment of the acquisition show good agreement with prediction*, but a more detailed performance assessment is ongoing. LISA Pathfinder apogee is now above the inner radiation belts, and the next burn should take the apogee above the complete radiation belt. The next burn, ARM#4, is planned for 21:02 UTC [22:02 CET] tonight. Note that ARM#4 will be the largest burn so far, expected to run about 34 minutes (the others have run or are planned to run for 28, 33, 20, 15 and 9 minutes, respectively, rounded to the nearest minute). 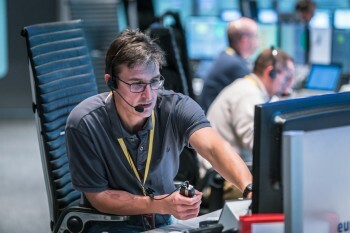 The craft remains in good shape and the mission control team at ESOC continue working, as they have since launch on 3 December, around the clock in the Main Control Room at ESOC. Note*: If the ground station ‘sees’ the spacecraft’s signals at the expected time, then that’s a very strong indication that the most recent burn was substantially good (otherwise the acquisition would be sooner or later than expected). The mission control team will wait for flight dynamics to do a detailed orbit determination to formally confirm each burn. By the way, while this is not the LPF main engine thruster, this video shows a test burn for a thruster using technology very similar to that on the LISA Pathfinder propulsion module. Note how hot the thruster throat gets! All sounds like it’s going to plan so far. Congratulations and keep up the blog entries – it’s great seeing all the hard work and analysis of the ESA and Airbus team being put into action.